Welcome to December, people! The festivities have begun. For now, take a look at our roundup of the latest news, including Facebook’s Inspiration resource, how The Big Issue is going cashless, the updated Google search bar, and YouTube’s ‘Autoplay on Home’ feature. Enjoy! A recently released study has found that the ways in which people thought they could avoid personalisation on Google, such as through using incognito mode or logging out of their Google account, may not actually make any difference to the results that are shown. The study was conducted back in June of this year – right at the heart of the US midterm elections. The goal, wait for it, was to find out “whether Google’s search results exacerbate ideological bubbles by feeding you only information you’ve signalled you want to consume via past behaviour and the data collected about you”. Lots of words. Election inspired, the study based around searching three divisive terms: “gun control,” “immigration,” and “vaccinations.” The company said that the discrepancies that showed “could not be explained by changes in location, time, by being logged in to Google, or by Google testing algorithm changes to a small subset of users”. Some of the glaring differences included the news sources used, the position of links, as well as how news articles were shown – with “as many as 22 different domains showing up in the first page of results for “vaccinations”. Experts have pointed out that DuckDuckGo is technically a biased source, so some may want to take the findings with a pinch of salt. Plus, there’s an argument that personalisation isn’t always a bad thing – perhaps it’s just a case of how Google manages the situation. Find out more on the full study over at The Verge. Another exciting launch this week came from Facebook, which has released a new global resource designed to help users of its Facebook for Business platform to be more creative. By launching this resource, Facebook is hoping to show its “commitment to creativity” by educating and empowering creators and builders to make better use of the Facebook apps. The Inspiration area will include “best in class ad examples”, as well as a leaderboard of the top performing ads of the month from each vertical – hopefully providing people with inspiration on what’s working well. Read more on the story, including how you can find the Inspiration section, over at The Drum. In a bid to combat a rising dependency on card payments, The Big Issue magazine is now trialling contactless payments for its vendors to help them sell more magazines. iZettle is helping them with the launch, following a research study into how people are paying for things in the modern day. The study found that one in five Brits “never carry cash anymore”, while contactless payments doubled in 2018 to 5.6bn transactions. This lined up with a drop in note and coin usage by 15%. For now, 20 of the magazine sellers across London and Bristol will trial the contactless payments, before plans to expand to five UK cities – and eventually nationally after that. Find out more on the story over at The Drum, or keep an eye out for your local Big Issue seller! This week saw Google start rolling out a new search results page design, boasting a rounded search bar that sticks to the top of the page as you scroll through the SERPs. Google first began testing this new update back in the summer, with it now rolling out to all users. The key difference, as we mentioned, is that the new search bar header will stick to the top of the search results page as you scroll down – unlike the previous iteration, which forced you to scroll back to the top of the page in order to start a new search. The other difference eagle-eyed users will spot is the shape of the search bar, which has had a little revamp. Now, it features a smooth-cornered, rounded design, an update on the previous boxy version. While Google updates tend to cause a lot of people to moan, some experts are saying the move may promote more searches, due to the search bar being more easily accessible to people scrolling. Only time will tell. For now, the new design is only on desktop, not mobile search results, but keep an eye out. Check out more on the news, or the impact it may have, over at Search Engine Land. In response to feedback from users requesting easier ways to preview videos, YouTube videos in the home tab will now autoplay by default in a bid to entice people to click. When the videos autoplay they won’t feature audio, although captions will be featured when they’re available. YouTube has said that previewing videos in this way will help users “make more informed decisions about whether you want to watch a video”, with a end goal of encouraging “longer engagement with videos you choose to watch”. That doesn’t mean it’s time to forget the thumbnails, though. Thumbnails will still be displayed for a moment before a video starts to autoplay, plus there are options to turn off the feature – meaning a standard thumbnail will be what is displayed. Users can choose to opt out within the settings menu, or choose for autoplay to only happen when the device is connected to Wi-Fi. “Autoplay on Home”, as YouTube have called it, will be rolling out on iOS and Android over the next few weeks, so don’t forget to keep an eye out for the change. Find out more details over at Search Engine Journal. 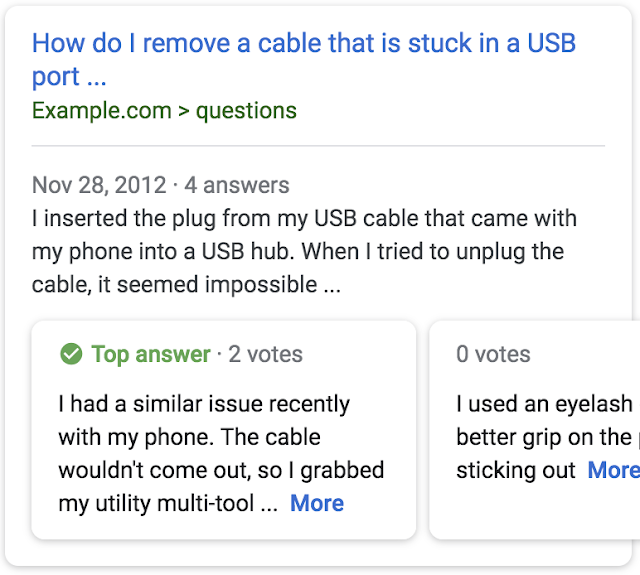 The rich result type Google uses for question and answer pages is now available for all websites, meaning that all sites can now be eligible to display these rich results by “marking up their Q&A content with the appropriate structured data”. One thing that people should keep in mind is that just because you’re eligible, doesn’t necessarily mean you’ll be displayed that way. But at least now we have the option. After all, not using the structured data means you definitely won’t see your content displayed as a rich result. If you want to drive more traffic to your Q&A pages, then implementing the structured data is well worth doing. Plus, you can use Google’s structured data testing tool to preview how the pages will appear in search, as well as seeing if you’ve done it all correctly. How helpful. Once you’ve implemented the change, you can track how often your rich results show in the SERPs using Google Search Console’s ‘performance’ report as well as seeing which queries were used to trigger them. Check out more on the news, and how you can use it, at Search Engine Journal. Us, that’s us! 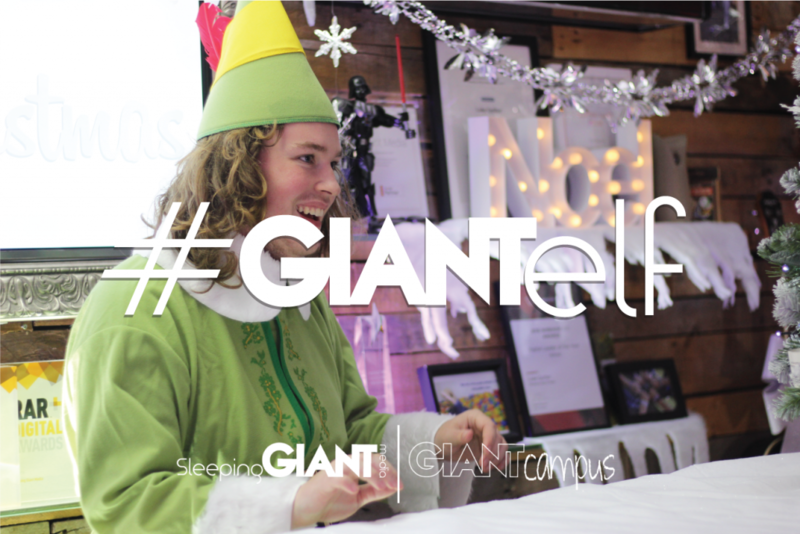 We’re giving away a member of our team for one day if you can correctly guess the answer to our Christmas #GIANTelf competition. Simply click the image below to visit the webpage, watch the video and answer the question! Good luck! Now, the only question is – what will you make them do….